Every research cruise holds the potential for a surprising discovery — something that perhaps will overturn conventional wisdom. It takes luck. But it also takes scientists who can work together, think creatively, question assumptions, and follow where the data lead. For Emily Klein, a marine geochemist at Duke University, uncovering the unexpected has become almost routine. Anticipating what surprises await is for her one of the most rewarding parts of research. Emily studies volcanic eruptions and the creation of new crust on the ocean floor. To understand these eruptions, she focuses on processes that take place beneath the ocean floor, such as where the magma comes from and how it moves through the crust. Emily finds clues to these hidden processes by studying the chemical makeup of lava collected from the ocean floor. The presence of crystals and variations in the amounts of both common and rare elements and isotopes in the lava can tell Emily a great deal about magma’s journey to the surface. New ocean crust is created along the mid-ocean ridges that thread their way through the Atlantic, Pacific, and Indian Oceans. These undersea volcanic mountain chains rise at the edges of diverging tectonic plates. As the plates pull apart, magma wells up from the magma chamber, pushing through cracks in the crust towards the surface. Magma that does not reach the surface solidifies in these cracks, forming slabs of lava inside the crust called dikes. Cartoon of the structure of the ocean crust. Until recently, most mid-ocean ridge models assumed that magma always rises straight up from the magma chamber to the surface. But in 1999, Emily participated in a voyage to an unusual geological feature called the Hess Deep Rift that revealed a far more complex picture. Located along the East Pacific Rise and as deep as six kilometers below sea level, the Hess Deep Rift resembles an immense underwater Grand Canyon. Tectonic events had ripped the crust open, offering scientists such as Emily a rare glimpse inside the crust. Among the exposed features are dikes where magma had risen up through the crust one million years ago. Emily and her colleagues first deployed two remotely operated vehicles to map and photograph an area along the north wall of the rift where the dikes are exposed. Next they guided the deep submersible Alvin on 15 dives into the rift to collect rock samples from the dikes and other features. Back on the ship, the scientists carefully sawed, sorted, and cataloged the samples, then divvied them up. Emily hauled her share of rocks back to her lab at Duke University. She and her students first crushed the remaining fresh rock,then began the time-consuming process of preparing the samples for chemical analysis, which included either melting the rock powder or dissolving it in strong acids. They then fed the solutions they created into sophisticated instruments that determined the chemical compositions of the samples. One instrument, called an Inductively Coupled Plasma Mass Spectrometer, is capable of identifying elements present in quantities as low as a few parts per billion. The chemical makeup of lava can provide important insights into the temperatures and pressures that the magma was subject to beneath the crust and changes that it may have undergone during their journey to the surface. It can also help scientists identify the parts of the magma chamber where the magma may have originated. That is where two of the most surprising results of the Hess Deep cruise came to light. 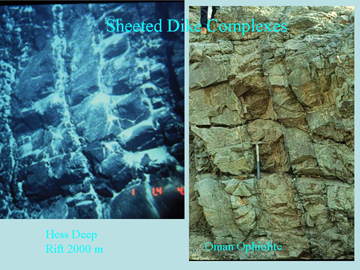 Photographs of vertical dikes from the walls of Hess Deep (left panel) and on land (right panel). Emily examined samples from a number of dikes, including dikes that were located side-by-side in the rift wall. She and other scientists assumed these adjacent dikes likely originated from the same part of the magma chamber at about the same time, and were therefore chemically similar. But to their surprise, Emily and her student Michael Stewart discovered that the chemical compositions of adjacent dikes often differed dramatically. The magma feeding these dikes must have come from completely different parts of the magma chamber. Emily and her colleagues had also expected that the composition of lava on top of the ocean floor would match the composition of the dikes directly underneath. After all, these dikes supposedly fed the lava on top. 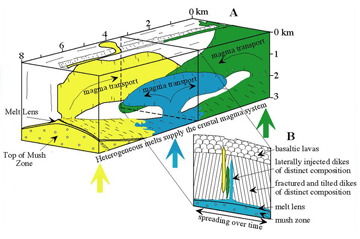 But instead they discovered that many of the dikes at Hess Deep contained magma that never even reached the surface. It was too dense. Many nearby dikes, however, did reach the surface. They contained lightweight crystals called plagioclase that made the magma buoyant enough to reach the sea floor. Both of these surprising findings have forced scientists to rethink their two-dimensional view of mid-ocean ridges. They can no longer assume magma rises straight up from the magma chamber to the ocean floor. Nor can they confidently infer the chemical makeup of the dikes and magma chamber simply by studying the makeup of lava on the sea floor. Instead they have to consider that magma can travel sideways through the crust as it rises from different regions of the magma chamber. These insights will help scientists better understand the complex processes that give shape to Earth’s new crust. Sometimes new discoveries pop up where they are least expected. In 2002, Emily helped lead a cruise to the East Pacific Rise in the vicinity of a small tectonic plate called the Galapagos Microplate. Her goal was to map and sample lava from what she thought was a small new rift called the “incipient rift." This crack begins at the East Pacific Rise and runs eastward, perpendicular to the main rift. Emily and her colleague Debbie Smith had expected to only find volcanic activity at the western end abutting the East Pacific Rise. But to everybody’s surprise, they found evidence of recent volcanic activity along the entire length of the rift. They now realize that they were looking at a full-fledged plate boundary, specifically part of the northern boundary of what may be a newly forming microplate. Because of this surprising discovery, scientists are now rethinking the structure and evolution of the entire Galapagos microplate region. The take-home message, says Emily, is that scientists often head out on cruises thinking that they are going to see one thing. But soon they discover that something completely unexpected is happening. That, says Emily, is the nature of exploration. As Emily prepares for her next cruise, she is taking this message to heart. Our knowledge of Earth and its oceans has been pieced together through the work of many individuals. Increasingly women have made significant contributions to marine science. 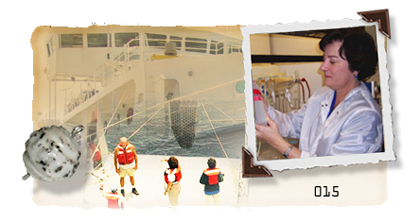 In this site we feature the careers of remarkable women in oceanography. Each woman has followed a different path to her career and has gathered unique insights about her profession. Learn how these women are contributing to our understanding and appreciation of the ocean and how they go about their daily work. Melanie Holland studies the microbes that thrive in scalding temperatures surrounding hydrothermal vents. These amazing organisms not only reveal important information about the vent communities, they may also provide insights into the origin of life on Earth and the possible existence of life on other planets. Master Lego-constructor and former bicycle-racer Dawn Wright has immersed herself in two disciplines. As a geologist, she is studying the cracks that form in the seafloor along the mid-ocean ridge. As a geographer, she is developing software that oceanographers are using to interpret seafloor data. Lauren Mullineaux’s research group studies a side of benthic organisms (animals that live on the seafloor) that until recently has received little attention. Technical illustrator Jo Griffith hasn’t picked up a pen in over five years. Instead she uses a variety of computer programs to create graphs, maps, and illustrations for researchers. Emily collects rocks from the deep seafloor. The chemicals that make up the rocks provide clues to how the oceanic crust is built. Wen-lu Zhu studies the properties of rocks found deep in the ocean crust by recreating those conditions in the laboratory. Ashanti Pyrtle studies the fate of radioactive material that enters rivers, lakes, and oceans. She also advises minority science students on how to navigate through graduate school and prepare for a career afterwards. As Third Engineer onboard the Research Vessel Thomas G. Thompson, Debby Ramsey helps keep all of the equipment that has moving parts running smoothly. Marine seismologist Maya Tolstoy helps find active volcanoes on the seafloor by listening for their eruptions. Rose Dufour and her job-share partner Elizabeth Brenner create the schedules for four research ships. The challenge is to keep the scientists, funding agencies, and foreign governments happy. Claudia Benitez-Nelson uses radioactive isotopes to study the complex world of nutrient cycling in the oceans. Kathryn Kelly studies how changing ocean currents affect the climate. And she does all of her research from the comfort of her office. Amy studies the interactions between ocean currents and climate. These interactions are very complex. Kathryn Gillis dives to rifts in the seafloor that are as deep as six kilometers to learn about the processes taking place within the ocean crust. As a scientist, Margaret Leinen studied sediments that have accumulated on the ocean floor. Now as the Assistant Director of Geosciences at the National Science Foundation, she oversees programs in Earth, Atmosphere, Ocean, and Environmental Sciences. She is also working on initiatives to bring more women and minorities into these fields.